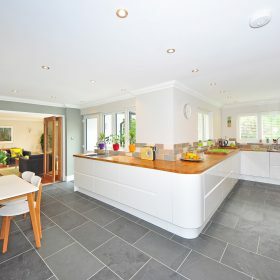 In kitchens underfloor heating is a great way to warm your feet and in the right circumstances underfloor heating can heat the entire kitchen. In kitchens rectangular in shape we recommend using our mat systems as they will be faster to install. For smaller, more awkwardly shaped kitchens (Islands etc), use our HQ wire system. 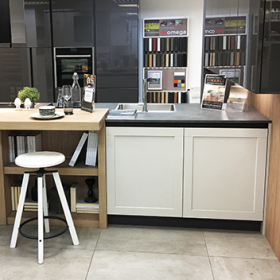 In newly built kitchens with floor insulation already installed, or by using insulated tile backer boards our heating products can be used as stand alone heating. As a general rule you will need a minimum of around 6m² and you will need to use our Warmtoes 200 watts per m² to generate enough heat. Email us your plans and we will calculate the heating you require. If using the heating to warm the tiles in your kitchen use our 160watt mat. If you are looking for extra heat use the HQ 200w mat. Our 160 watt and 200 watt mats are similar prices. The mats are very easy to install. 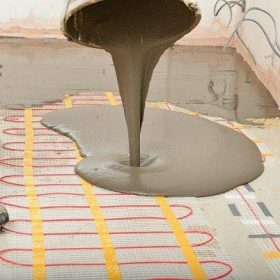 If you are you looking for underfloor heating under a wooden or carpeted floor visit the HQ-foil information page. At underfloor Hq we price our 160 watt mats almost the same as our 200 watt. The 200 watt will heat up quicker and generate more heat. Don’t forget that once the tiles are down the opportunity for underfloor heating is lost. You cannot retro fit so make the right choice! Our products are available in local retailers. Contact us for details of your nearest store.